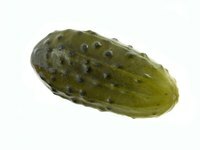 Recipes for dill pickles generally call for at least one bunch of fresh dill, which gives the pickles their distinct flavor. There may be times when fresh dill is not available because it's out of season or you simply can't find it at the market. While the flavor of fresh dill is more pronounced and often preferred, it's possible to substitute dried dill for fresh. Strip the dill leaves, or the weed, from a dried sprig of dill. Alternately, measure 2 tsp. bottled dry dill weed for each sprig of fresh dill called for. Add dill weed to the mortar and crush with the pestle to release the flavor. If you don't have a mortar and pestle, pile the dry dill weed on a cutting board and crush by chopping with a heavy kitchen knife. Add crushed dry dill weed in place of the fresh dill while following the pickle recipe. Add a teaspoon of dill seed to further boost the flavor, if desired.